Mutarotation is the change in the optical rotation because of the change in the equilibrium between two anomers, when the corresponding stereocenters interconvert. 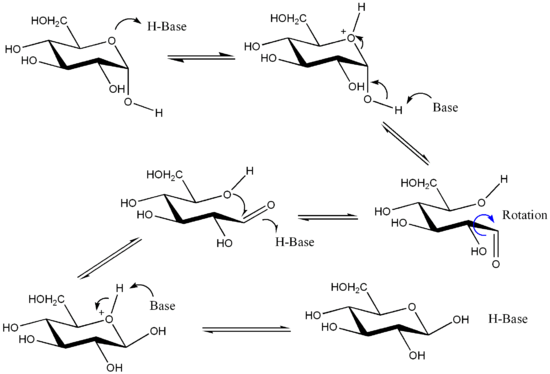 Cyclic sugars show mutarotation as α and β anomeric forms interconvert. The optical rotation of the solution depends on the optical rotation of each anomer and their ratio in the solution. Mutarotation was discovered by French chemist Dubrunfaut in 1846, when he noticed that the specific rotation of aqueous sugar solution changes with time. The α and β anomers are diastereomers of each other and usually have different specific rotations. A solution or liquid sample of a pure α anomer will rotate plane polarised light by a different amount and/or in the opposite direction than the pure β anomer of that compound. The optical rotation of the solution depends on the optical rotation of each anomer and their ratio in the solution. The observed rotation of the sample is the weighted sum of the optical rotation of each anomer weighted by the amount of that anomer present. Therefore one can use a polarimeter to measure the rotation of a sample and then calculate the ratio of the two anomers present from the enantiomeric excess, as long as one knows the rotation of each pure anomer. One can monitor the mutarotation process over time or determine the equilibrium mixture by observing the optical rotation and how it changes. ↑ Francis Carey (2000). Organic Chemistry (4th, McGraw-Hill Higher Education Press ed. ).